Sherlock Snacks is a plucky mouse detective. He loves solving mysteries, eating pizza and making friends. 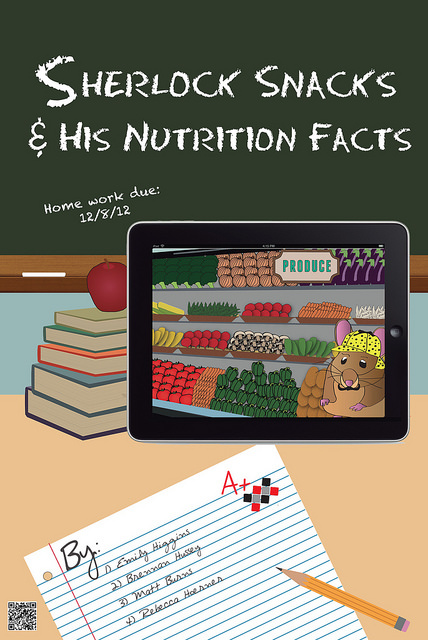 Sherlock wants to teach you how to make great meal choices through his interactive iBook, Sherlock Snacks and his Nutrition Facts! Help him solve his food dilemma and figure out the villain along the way. Soon you can read along with Sherlock on the iPad for an engaging and educational experience. Can you spot all the clues? Sherlock’s goal is to make being healthy fun by teaching the right habits early on in a kid-friendly way. He explains how to look at a nutrition label and a few key elements in making the right choice. Specifically, Sherlock teaches about ingredients, sugar and serving size using the interactive elements that iBook provides, such as quizzes and games. If kids start looking at the label now, then when they get older they will be able to learn more about what is good for them to eat and what isn’t. By promoting the idea of better choices and not cutting out items completely, we hope to make children more health-conscious now and in the future. A small change can make a big difference. This iBook is designed using iBooks Author and incorporates HTML5 for animation and interactivity using the program Hype. Sherlock’s graphics were designed using Adobe Illustrator and Photoshop.